I Get Google Alerts for my name. One recurring one had me baffled for a bit, and another more recent one made me laugh. 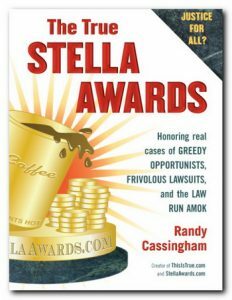 First, I was baffled that several times per week, I get alerts saying you can get (“FREE!”) a bootleg ebook copy of my True Stella Awards book. If the listings are to be believed, hundreds of sites are offering that book to anyone who wanted to download it. Put simply, I just didn’t believe it, especially since the “details” shown often have no relation to my book, are rife with typos, and/or have other scammy characteristics, like using a brand name that clearly doesn’t actually match the URL. If included, I’ve smeared the “brand name” (and URL) of these scammer sites. Note the highlighted misspelling. If they can’t even spell “download” they probably aren’t actually offering them! I pondered it, and then asked a friend who’s an expert in scams if I was right about what their angle was. Yep, he was familiar with the gag, and said I had it pretty much correct: first, you have to “register” to get the “free” download — but hey! Then you can download all sorts of books! Now you’ve given scammers your email address, and proven you’re gullible. Note the description not only has mixed languages, but doesn’t even relate to the book being advertised. And you can “Pre Order” a book released in …2005?! Audiobook copies too! “Stella” was never released as an audio book. And again, not consistent: is this for an “audiobook for Kindle” or a “PDF”? Step 2 is to put your credit card on file for books that are available at “steep discounts” and such. In for an inch, in for a mile: you want that free book, so now you’re giving criminals your credit card info! You starting to get suspicious YET? Well, plenty let their greed of “free” (aka “stealing”) blind them to the obvious dangers. You? Probably not, but thousands do. And if that’s not their scheme, my friend went on to say, it’s probably simply that they have you load a “toolbar” to enable the supposed downloads: malware, of course. Congratulations: the criminals can now see not only every site you go to, but might also have the capability to intercept your keystrokes. You know, when you type in your user name and password at your bank or retirement account? Yep, it’s that easy to fall for their semi-clever come-ons. Is this for a book about crazy lawsuits, or “The Achievements, Campaigns, Events, Triumphs, and Legacies of Every President”? Neither: it’s a scam. And yes, I do find it amazing that some of these sites are actually hosted by Google! So there you go: thinking before you fall for stuff like this could save you from a world of hurt. And the Other One? The one that made me laugh? A newer come-on — again with the True Stella Awards book: sites offering “Hardcover **BRAND NEW**” copies of the title, and I’ve seen this exact same thing on multiple sites now too, making me think this is a scam also. It might be legit: it’s possible they have some real copies. But looking at the listings give me pause. First, once you click through, and all the sites are the exact same layout, the illustration shows the cover of the paperback version, not the hardcover. 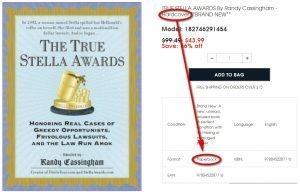 Then, it shows that their price is “56% off” …56 percent off a supposed retail price of $99.49, so they’ll sell you a (maybe) brand new copy of the paperback for only $43.99. Hey, my terrific book on crazy lawsuits might even be worth that to you, I don’t know! But you should still know that the paperback cover price was $13, not a hundred, and the hardcover was $18.95 …but both are now “out of print” and you can only get them “pre-owned” …aka used. Pristine? Maybe, and maybe not. Want it in ebook format? I can’t sell it to you, since I’m not the publisher. But Amazon can, and it’s only $5.99 there. If you’re not a Kindle user, it’s very likely you can get it for your iPad, Android tablet, Nook, or other reading device for a similar price from a legitimate seller, like Google Play, iBooks, or Barnes and Noble. Or maybe even your local library (you did know most can loan ebooks, right?) Still, that’s a very small price to pay if you want to read the ebook without getting malware or scammed. And if you really do want it in hardcover, you have choices. You can get them from third-party sellers on Amazon (at that same link), or from me: I do still have some. The new copies I got from the publisher are long gone, so now I have to buy “like new” copies on the open market, and thus have to charge more than even the $18.95 cover price — though you get free shipping in the USA, I’ve confirmed they’re first edition copies, and I’m happy to autograph them for you. Those are available in True’s shopping cart. Now and then, though, I myself am “taken” when I buy them in the open market: they’re supposedly “like new” or “very good condition” …but sometimes they aren’t. If they’re really bad, I complain and get my money back; other times I figure I took the chance, and lost, and put them in the “distressed” pile. So if you just want a “reading copy” that’s definitely not in “like new condition” (that is, the dust jacket is probably torn, marked, or even missing, pages might be dirty or scuffed, but it’s definitely still readable), you can get those “distressed” copies at a significant discount from the cleaner ones — that’s how I dispose of those copies that I got “taken” on. Better for them to be read than tossed, I think — and yes, I’ll still autograph those copies. The lesson: if it’s not the publisher or a clearly legitimate retailer offering a product, but rather a site clearly doing something underhanded, think about who is doing it. Pretty much by definition, stealing is done by criminals, and they have a motive — and that motive isn’t to give you something for nothing. You’re not an accomplice, you’re the mark. Or, the shorter, general advice: Think! Also: How to create Google Alerts. This is a good analysis and should be read widely. It’s amazing what scammers try to do to screw the public. Thanks for the posting. You can probably buy it and read it on Amazon if you don’t have a Kindle. As an author, I have had my book offered for “free” both through Youtube and on google — each time, I contact the server and request that it be removed…I understand a number of contemporary authors have this problem. I get free books all the time. Amazon, Book bub, and Freebooksie are sites I use. I have received free ebooks from authors by signing up for their newsletter. Thankfully, I have the common sense to never add my credit card or any toolbars. But for emails, I created an email address (name)junkmail @ server.com. Anything that claims “send your email, and we will show you your (test score, mortgage rate, best price)” gets sent there. It disgusts me to see scammers who will hurt vulnerable people. * Project Gutenberg is an archive of material that is now in the public domain due to copyright expiration. Great place to get ‘classics’. I saw the kind of scam pages you’re talking about when I searched for repair manuals for my Smart Car. At least 4 sites claimed to have one for free download & wanted me to register to get it! NOPE!